We’d love your help. Let us know what’s wrong with this preview of Hapkido by Marc Tedeschi. This ground-breaking work is the first to comprehensively document the traditions, philosophy, and techniques of one of the world's most varied, exciting, and practical martial arts—Hapkido. More than 9,000 photographs introduce over 2,000 martial techniques, including strikes, kicks, blocks, avoiding movements, holds, joint locks, chokes, throws, falls, tumbling, ground f This ground-breaking work is the first to comprehensively document the traditions, philosophy, and techniques of one of the world's most varied, exciting, and practical martial arts—Hapkido. More than 9,000 photographs introduce over 2,000 martial techniques, including strikes, kicks, blocks, avoiding movements, holds, joint locks, chokes, throws, falls, tumbling, ground fighting, and weapons. Numerous closeups show precise grips, leverage methods, pressure points, hitting surfaces, and direction of force. To ask other readers questions about Hapkido, please sign up. Martial arts starter library kit 25 books. 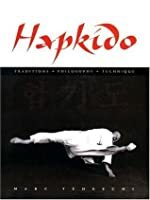 Probably the most comprehensive book every done on Hapkido and related arts, Tedeschi's book is huge, thick, and dense. Printed up on high quality paper with hundreds of illustrations and in-depth analysis of the art and its history, this is a superb book. Very large book that details just about everything there is to know about Hapkido. I always enjoyed studying Hapkido and love this book as a complete encyclopedia of the art. This book is as much history as martial arts, being a broad and deep overview of the art as a whole including hundreds of moves. OK, I know that not all the moves work as well in reality as they do in the dojo, but many do. A little practice will let you know what does and doesn’t work. This text is fascinating nonetheless. This is the most complete book on a Martial Art that I have seen printed in English. Not to say that it is in fact the most complete but like I said in the first sentence- This is the most complete book on a Martial Art that I have seen printed in English. I helps you remember what your Sabunim told you in class.